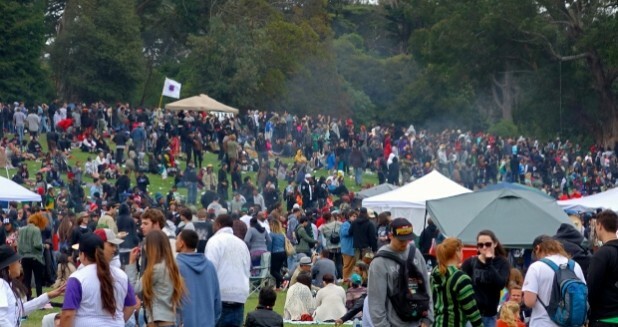 The unofficial pot-smoking party of 420 is located in Golden Gate Park, where thousands of marijuana enthusiasts gather on April 20th for a memorable day. San Francisco, of course, is known for the hippie movement. In the summer of 1967, more popularly tagged as the Summer of Love, thousands of hippies gathered in the neighborhood of Haight-Ashbury to celebrate a changing of time—the beginning of a (theoretically) utopian society of free love. What eventually happened, after crowding, disease and addiction to newly formulated drugs such as LSD, is that the visitors for the Summer of Love went home. The people departed but, in a way, left a permanent drug-stamp on San Francisco. Fast-forward 50 years, and there’s a new movement in town. It’s focused on the medical distribution of marijuana—legally—to California residents for ailments such as leukemia, cancer and insomnia. And over the years, the laws have loosened so much, residents—or those who carry a medical marijuana card—are now able to (more or less) smoke marijuana in public. So on April 20th, which coincides with the long-time cannabis code for smoking marijuana, why not spend a day in the park? Ten thousand+ pro-marijuana supporters do. DISCLAIMER: Without a medical marijuana card, possession of marijuana in California is ILLEGAL. It’s also ILLEGAL federally. But over the years, as long as you pick up your trash and act as an adult, the police usually leave you alone. But be smart; and don’t blame us for any problems you come across! 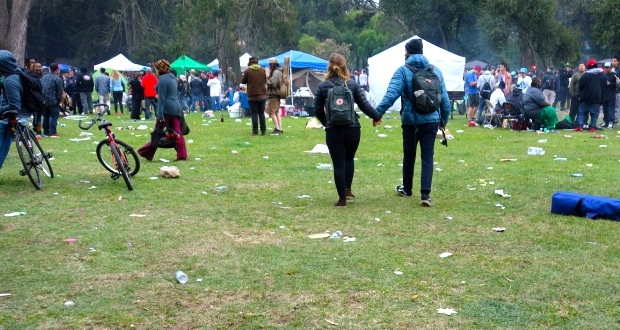 When you arrive at Hippie Hill, the unofficial location of the event, you’ll find a plethora of things to do. You can purchase any type of pro-marijuana merchandise, grab yourself a hot dog or burger from an unofficial vendor (even “edibles”) or just relax and listen to the crowd erupt into random cheers throughout the day. One thing is for sure: The people are here to be happy, mellow and cool. DISCLAIMER #2: The last couple of years, the event has been plagued with an excess of garbage. Come to enjoy the day, but don’t leave TONS of trash behind. To combat the problem, why not show up with a trash bag to clean as you go? The event starts roughly at 10:30 a.m. and continues throughout the day. The most dancing, cheering and largest drum circles happen around 4:20 p.m. The crowds usually disperse before sundown.